Spring planting will soon arrive here in Iowa, but planting our Calhoun County fields isn’t the only thing on my mind. My family is always looking for ways to embrace conservation and better manage our land, because we understand the benefits of improved water quality and soil sustainability extend far beyond our fields. This mindset defines any true steward of the land, and Iowa is blessed with an abundance of conservation-minded farmers. This is reflected in the Iowa Environmental Leader Award, which recognizes the exemplary voluntary efforts of Iowa’s farmers who are committed to healthy soils and improved water quality. We were honored to receive a 2016 Iowa Environmental Leader Award last August at the Iowa State Fair from Iowa’s governor, lieutenant governor, Iowa Department of Agriculture and Land Stewardship staff and Iowa Department of Natural Resources staff. It was inspiring to see how many other progressive, dedicated farm families across Iowa are redefining the sustainable nature of modern agriculture. Learning from the land is just part of my DNA. My great-great grandfather, John Dougherty, emigrated from Ireland and settled in Calhoun County north of Lake City in 1889. He purchased 200 acres, and history records that he “placed the land under a high state of cultivation,” a legacy my family carries on today with our Century Farm. I’m also guided by the philosophy of another Iowan, Aldo Leopold, whose “land ethic” called for a principled, caring relationship with nature. “When we see land as a community to which we belong, we may begin to use it with love and respect,” noted Leopold, author of the Sand County Almanac. The residue of the previous year’s crop helps hold our precious soil in place and builds organic matter in the soil. 1. Building on a legacy of conservation. Iowa agriculture reflects a long history of people helping the land. The process accelerated in 1935, when the Soil Conservation Service was created in the U.S. Department of Agriculture. In this era, young men with the Civilian Conservation Corps (CCC) worked on hundreds of Iowa farms to assist with soil-erosion-control projects, such as terracing hills, digging ponds, repairing gullies and planting trees for wind breaks. In 1948, more than 100,000 farmers from across the Midwest flocked to the National Soil Conservation Field Days in Dexter, Iowa, to learn new conservation practices. Even President Harry Truman made an appearance see farmers’ conservation efforts first-hand. (You can read more about it in my blog post “Riding with Harry,” where I interviewed a young Iowan who escorted Truman on a bulldozer in the fields.) While much has changed in farming since the 1930s and 1940s, one thing endures—our commitment to be good stewards of the land and keep our land productive for generations to come. 2. 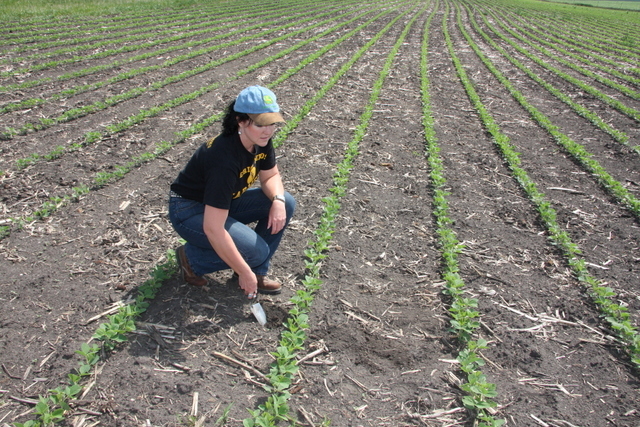 Prioritizing soil health. I’m convinced that unlocking the secrets of the soil is the next frontier in farming. As world population and food production demands rise, keeping our soil healthy and productive is of paramount importance. 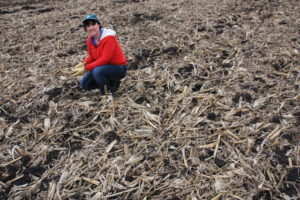 By using cover crops, diverse rotations and other systems, more Iowa farmers are increasing their soil’s organic matter while improving microbial activity. As a result, farmers are increasing water infiltration, controlling runoff and enhancing soil health—all while harvesting better yield and profit potential. 3. Balancing the three-legged stool of sustainability. Successful farm management involves environmental sustainability, economic sustainability and social sustainability that benefits not only our farm, but our community, state and beyond. Without all of those three legs, the sustainability stool falls down. That’s why my family has invested in a number of best-management practices, including soil testing to better manage fertilizer applications, grassed waterways and grassed field borders to help control soil erosion, conservation tillage, drainage water management, and the addition of windbreaks and shelterbelts. These practices help improve soil health, prevent erosion, boost yield potential and keep nutrients in place where they can nourish our crop and protect Iowa’s water quality. 6. Focusing on continuous improvement. A spirit of continuous improvement contributes to long-term success in any business, including our farm. My dad, Jim Dougherty, served as a township committee member with the Agricultural Stabilization and Conservation Service, the forerunner of USDA’s Natural Resources Conservation Service. Dad was also quick to see the value of conservation tillage and other practices that make the farm productive and sustainable. Today, we are using precision ag tools to maximize production and conservation. We never stop seeking solutions. 7. Developing a conservation philosophy. If you never try something different, how do you know if you’re maximizing your investment on every acre? My conservation philosophy is to keep learning, help my family do our best to protect Iowa’s precious soil and water resources, and pass on a legacy of conservation to future generations. 8. Providing leadership. We’ve hosted numerous media professionals at our farm, from the local newspaper to USA Today and “Market to Market,” to share what we’re doing to promote conservation and protect soil and water quality. In 2015, I also worked with the Iowa Food and Family Project to coordinate and host Expedition Yetter, a bus tour of farms in west-central Iowa that allowed urban Iowans to see conservation in action. (Watch “Market to Market’s” Expedition Yetter and water quality video here.) That same year, I also testified before the U.S. Senate Small Business Committee in Washington, D.C. to explain to federal lawmakers how conservation plays a key role on my family’s farm. 9. Enjoying the journey. Enhanced conservation, like improved farm management, is a quest that never ends. I value the legacy of farmland that was passed on to my family from previous generations and enjoy the challenge of maximizing our acres. With all the technology available today, it’s exciting to see what’s next as we keep learning from the land to enhance the sustainable nature of modern agriculture. Darcy Dougherty Maulsby is a proud member of a Century Farm family, author, entrepreneur, business owner, and farm leader from Lake City. Visit her online at www.darcymaulsby.com. * This editorial first appeared in the April 9, 2017, Sunday edition of the Fort Dodge Messenger. 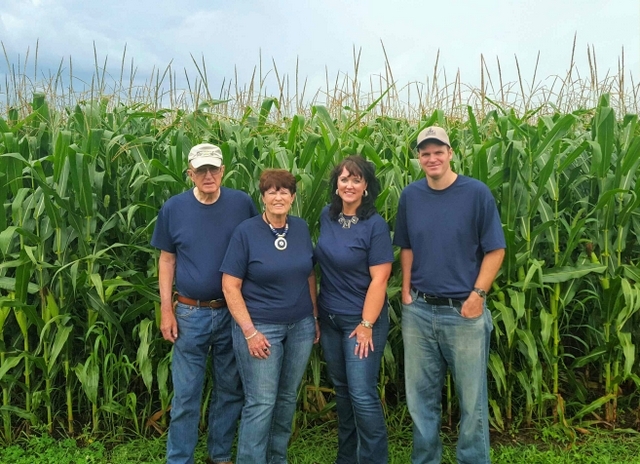 My family (including my dad, Jim, my mom, Jan, me and my younger brother, Jason, on our Calhoun County Century Farm.